The Restaurant Menu is an attractive way to present your cafe or restaurant menu. To create a Restaurant Menu item, go to Restaurant Menu > Add New Restaurant Menu Item from the admin panel. Enter a title for your restaurant menu item in the text field near the top of the screen. Restaurant Menu Item Price - Input a price for this restaurant menu item. Restaurant Menu Item Description - Input a textual description for this restaurant menu item. You can now assign your restaurant menu item to a category. On the right side of the screen you will see a section named "Restaurant Menu Category." Here you can select the category that you wish to add this item to. If you would like to add a new category, click on the “+ Add New Restaurant Menu Category” link and a text field will appear in which you can enter a name for your new category. Then click on “Add New Restaurant Menu Category”. Underneath the Categories section is the Featured Image section. Here you can set an image for your restaurant menu item. After you have uploaded an image, click the “Publish” button. 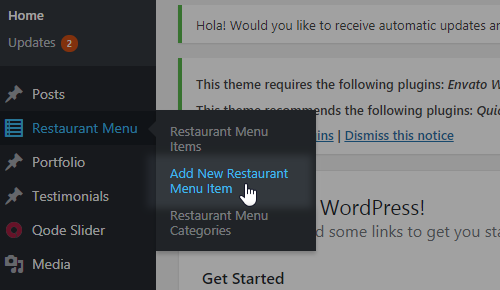 Finally, in order to display your restaurant menu items on a page, go to that page from the backend and click the “Add Elements” button, and from the elements menu select "Restaurant Menu List". Title - Input a title for your restaurant menu list. Label - Input a label for your restaurant menu list. Sublabel - Input a sublabel for the restaurant menu list. Show Featured Image - Set this option to "Yes" to display each item's featured image in the restaurant menu list. Order By - Choose how you would like to order the items in the list. Order - Choose between an ascending and descending order. 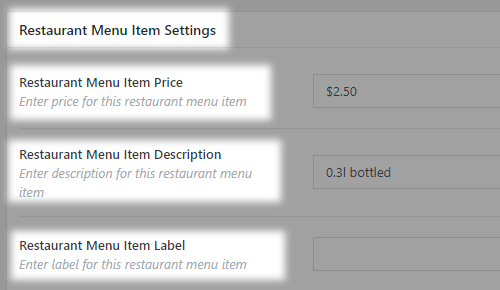 Restaurant Menu Category - If you would like to display only items from a certain category, enter the category slug here. Number of Restaurant Menu Items - Choose how many items you would like to display in the list. If you would like to display all your items, input "-1".